Locales that don't have a handbook yet, but have a forum welcome page on Codex or elsewhere, might want to move it to a page on the forums site. At the moment, the page.php template in the theme is not styled properly. 2574.png​ (422.8 KB) - added by ocean90 2 years ago. 2574.before.png​ (462.4 KB) - added by SergeyBiryukov 2 years ago. 2574.with-sidebar.png​ (387.7 KB) - added by SergeyBiryukov 2 years ago. 2574.without-sidebar.png​ (331.6 KB) - added by SergeyBiryukov 2 years ago. 2574.one-column-centered.png​ (533.9 KB) - added by SergeyBiryukov 2 years ago. 2574.two-columns-centered.png​ (625.4 KB) - added by SergeyBiryukov 2 years ago. 2574.one-column-with-sidebar.png​ (561.9 KB) - added by SergeyBiryukov 2 years ago. 2574.two-columns-full-width.png​ (589.7 KB) - added by SergeyBiryukov 2 years ago. 2574.one-template.patch​ (15.8 KB) - added by SergeyBiryukov 2 years ago. 2574.multiple-templates.patch​ (19.7 KB) - added by SergeyBiryukov 2 years ago. Support Theme: Make single page template consistent with the rest of the forums. I don't think that pages should get the same sidebar as the forums. Sidebars should contain content which is related to the main content. Looking and the Italian handbook and the sidebar looks a bit off. We'd need a separate template for the handbook, I guess. I was thinking of regular pages like ​https://ru.wordpress.org/support/forum-rules/, which should still have a sidebar, and the one from the forums fits there well. In this case I suggest that the default page.php is full-width like before and a new page template is added which provides the sidebar from the forums. Yep, I've just noticed that ​https://it.wordpress.org/support/handbook/ is a regular page too, not the handbook plugin. Support Theme: After , remove the sidebar from default page.php template. 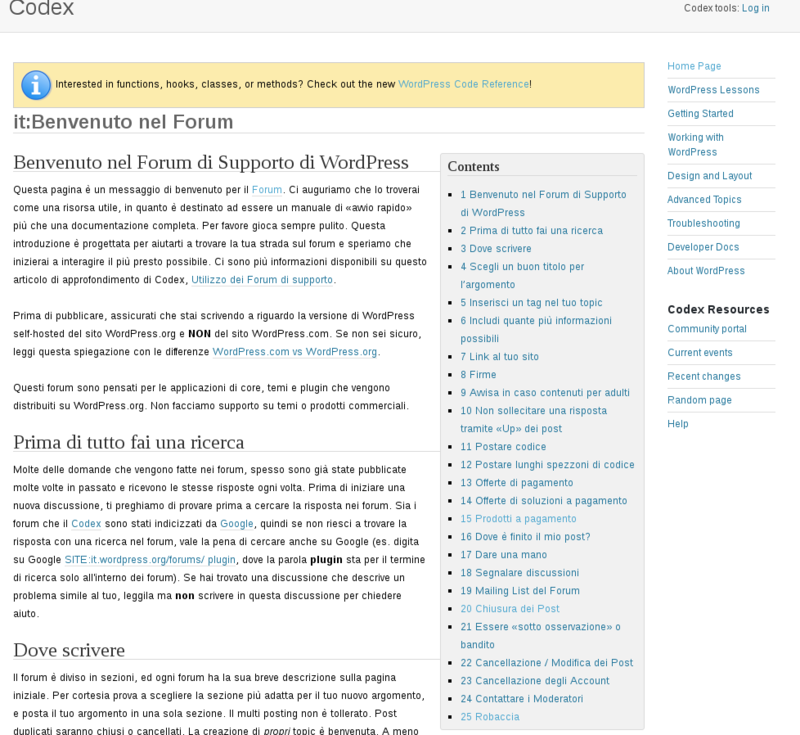 Introduce a new page-forums-sidebar.php template for a page with a sidebar from forums. Fwiw, I don't think pages in the support forum should have a sidebar. We discussed (but did not implement apparently) using the same design as ​this page from the new plugin directory. I know @mapk has opinions on this. Fwiw, I don't think pages in the support forum should have a sidebar. We discussed (but did not implement apparently) using the same design as ​this page from the new plugin directory. Thanks, I see now. It looked somewhat similar to that page, but without page title and in full width: 2574.before.png​. That didn't look consistent with the rest of the forums, also taking into account the font size difference, so I suspected that something's off, but didn't know how exactly it's supposed to look. "My Account" should be consistently displayed across the site rather than come and go on different pages. Having common views on pages might encourage users to take a look at other topics and maybe provide some help there while waiting for a reply. In full width, current template looks better with a sidebar than as a wall of text: 2574.with-sidebar.png​ vs. 2574.without-sidebar.png​. That said, I can remove the new template and make pages look like ​https://wordpress.org/plugins-wp/developers/ (restore larger font size, remove breadcrumbs, add left and right margin), if that would be a consensus here. 2574.one-template.patch​ implements comment:10. Seems to work for simple one-column content​, but a more complex page​ gets shifted to the right, because narrow layout doesn't really allow for any kind of in-page navigation, and it looks a bit weird when that navigation starts in the middle of the screen. Not every support page can be trimmed down to a single column without a navigation. Some pages make more sense as a part of the forums layout and navigation rather than standalone content. Some content doesn't fit well in a narrow column. It would probably help if we could create custom menus on forum pages, but there's no such option at the moment. Default page.php template for simple one-column content: 2574.one-column-centered.png​. A template with a forums sidebar for forum-related pages: 2574.one-column-with-sidebar.png​. A full-width template for wider content with navigation, e.g. handbooks: 2574.two-columns-full-width.png​. 2574.multiple-templates.patch​ implements that. Any objections? 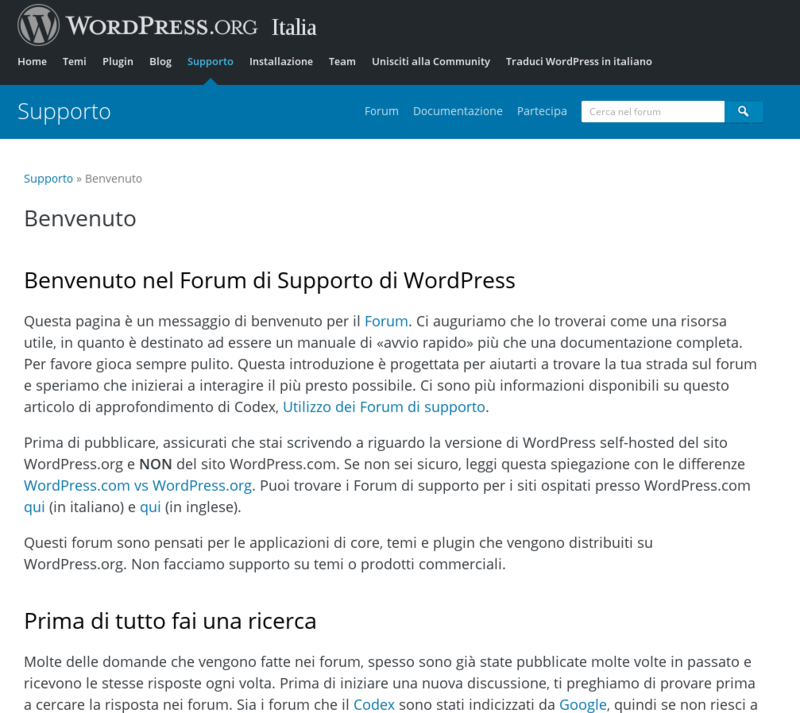 I totally agree with @SergeyBiryukov :"
The old Welcome Support Forum page ​https://codex.wordpress.org/it:Benvenuto_nel_Forum#Prodotti_a_pagamento has a useful sidebar that we are going to write bespoke to relative link inside the document to reach them better. Use default page.php template for simple one-column content. Keep page-forums-sidebar.php template for forum-related pages. Add page-full-width.php template for wider content with in-page navigation. Support Theme: Use correct text domain for strings in template-parts/content-page.php.